Pitman Training Cork we have a wide range of Finance and Accounting Training Courses available. All our training courses are practical with no theory, just the skills that employers demand. Our Training Courses have proven results because 87% of our students have secured jobs within the same year they graduated! Our Accounting Technician Diploma with AAT Qualification is a powerhouse of a course. 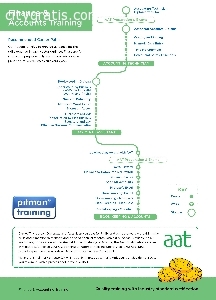 It combines the excellence of Pitman Training’s reputation and practical learning with industry leading knowledge from AAT, the professional body for accountancy. Whether you’ve already completed a book-keeping or accounting course, this Diploma covers it all and takes you to a new level. A fantastic course for those who wish to develop a comprehensive range of manual and computerised book-keeping skills, together with payroll and spreadsheet knowledge, our Accounting Technician Diploma with AAT Qualification puts you in great stead for many finance related roles. You’ll be sure to be up to speed on all the latest advancements, and gain a very practical, valuable Diploma, meaning you will have highly regarded qualifications that are sure to boost your CV. A significant part of the course is that we will provide you with access to the AAT network, via AAT student membership, so that you can make some great network connections with thousands of others in the financial world membership, so that you can make some great network connections with thousands of others in the financial world. Whether you’ve already got basic skills or are venturing into the world of finance for the first time, this qualification could be the rocket to really launch your career. This powerful diploma combines the excellence of Pitman Training’s reputation, practical learning approach and industry leading knowledge in accountancy. With the this Diploma you’ll get all of the essential skills required to be a highly valued assistant to company accountants in larger firms – collecting, checking and analysing financial information on their behalf. Or, if you choose to work in a smaller business, your diploma will give you the knowledge and confidence to run a busy accounts department. You may also have aspirations to provide your own accountancy service to local firms, in which case you can be certain this diploma will provide you with the knowledge you need. Our Book-keeping Award with AAT Qualification is a great building block for your career in accounting or office management, and your ‘AAT Certificate in Bookkeeping’ looks great on your CV. If you’ve got a head for figures and want to learn the art of manual book-keeping, and gain a recognised industry qualification as you do, this Award is for you. Whether you’re in the first stages of your career, or want qualifications to demonstrate credibility to clients, or you’re a small business owner who wants to get a firmer grip on your finances, the practical nature of this course is great for all. Our Book-keeping Award is a great building block for your career in accounting or office management. Whether you’re looking to gain some book-keeping skills for work or for your own use, this is a fast-track book-keeping course for people with an aptitude for figures. Unlike some book-keeping courses, ours gives you all the time management benefits of flexibility to suit your work or home life. You can start anytime and study part or full time, depending on your situation. Using real-life scenarios for manual book-keeping you’ll raise your standards quickly to a high level. And, if the need arises, there’s always an experienced course advisor on hand to help you out. Our Finance Award will equip you with great skills in a condensed time-scale. A ‘mini-diploma’ in its own right, you’ll learn computerised accounts as well as manual book-keeping. Whether you’re looking to gain some book-keeping abilities for your own use or want to work in a company’s accounts department or for a small business, this fast-track book-keeping programme requires an aptitude for figures and attention to detail. Like all our training, it’s also highly practical, containing work-based scenarios and examples. If you have an aptitude for figures and wish to learn manual and computerised payroll, then this practical Award is for you. Through studying for this Award, you will become confident in popular and indemand software.